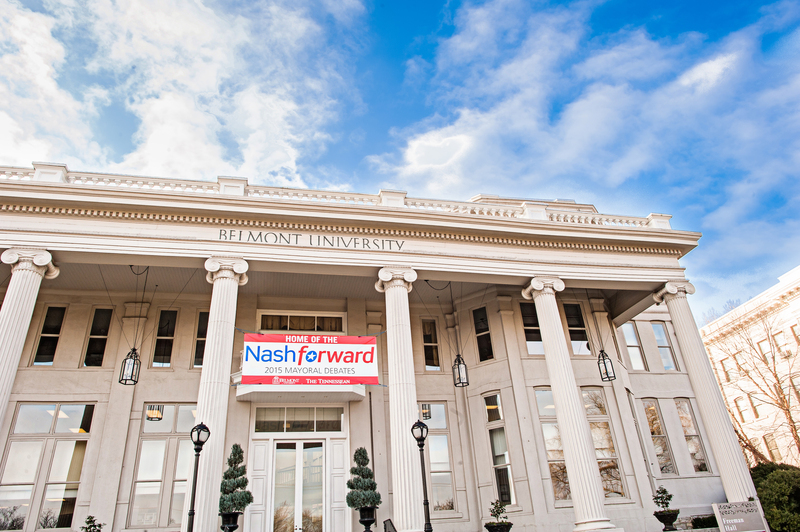 Nashville’s two final mayoral candidates, Megan Barry and David Fox, found themselves on a Belmont University stage one last time for the third and final Nashforward debate on Wednesday, August 19. Presented by Belmont University and The Tennessean, with broadcast sponsor WSMV-TV, the city’s premier mayoral debate series included a traditional style debate held on May 21 and a second, town hall debate held on June 18. The final debate, attended by more than 350 community members, was between Barry and Fox, the two candidates vying for Metro’s open mayoral position. With a number of topics top-of-mind including municipal services and ordinances, education, diversity and tourism, co-moderators David Plazas, opinion engagement editor at the Tennessean, and Demetria Kalodimos, WSMV-TV anchorperson, asked questions of both candidates pertaining to these issues and others. Like the two debates prior, a ‘lightning round’ included lighter questions designed to showcase candidates’ personalities. The event was broadcast live, in its entirety, on WSMV-TV.